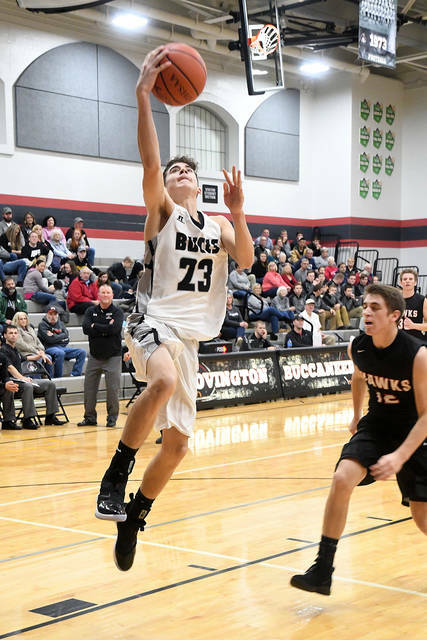 Ben Robinson|GoBuccs.com Covington’s Kleyton Maschino goes up for two points Friday night against Mississinawa Valley. 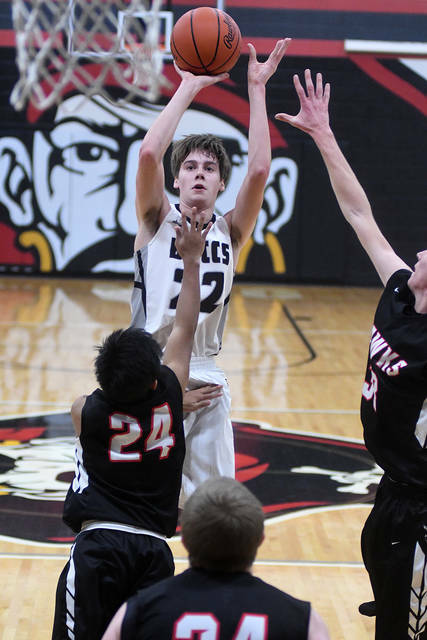 Ben Robinson|GoBuccs.com Zach Kunts shoots against Mississinawa Valley Friday night. COVINGTON — Covington opened up Cross County Conference play on Friday as it played host to Mississinawa Valley and over the first six minutes of the game, things looked very bleak for the Buccaneers as the Blackhawks jumped out to a 13-0 lead. It wasn’t until a huge three-pointer by Zach Kuntz with 1:57 left in the first that Covington was able to find the bottom of the net. Winning is what Covington did on Friday to even its record at 1-1 overall and move to 1-0 in the CCC. The Buccs travel to Versailles Saturday. https://www.dailycall.com/wp-content/uploads/sites/30/2018/12/web1_kleyton-maschino.jpgBen Robinson|GoBuccs.com Covington’s Kleyton Maschino goes up for two points Friday night against Mississinawa Valley. https://www.dailycall.com/wp-content/uploads/sites/30/2018/12/web1_zach-kuntz.jpgBen Robinson|GoBuccs.com Zach Kunts shoots against Mississinawa Valley Friday night.